Lighting-Gallery-net - EOL Lighting/EOL Sunbeam Incandescent.Arcing. The filament is broken but the bulb is still lighting because an arc formed in the gap. The bulb is also making a high pitched humming sound. Once the power is turned off and on again, the bulb will no longer light up. I've never seen such arcing in 230V incandescent lamps here in Israel. Usually the arc flashing when turning on the lamp, than it trips the main circuit breaker. Yup. It usually happens for a split second before tripping. However, I have managed to get an incandescent lamp to arc for longer by having a ballast in series with it when it failed. It melted down right to the glass support and only stopped arcing when I turned it off and let it cool. I'm guessing why 230v lamps trip the breaker when they arc is due to the higher voltage giving more power to the arc to melt the filament and short out the lamp, but with 120v lamps, the arc does not have as much power so it just sits there. That's just what i think might be happening, might be wrong for all i know. If the filament breaks somewhere away from the ends, (like it has here) then the arc can impinge of refactory tungsten at either end and the rest of the filament will act as the regulating resistance. This is most often seen with single-coil filament lamps with an older "wreath" filament design..."C" shape with five or six radial supports. These generally have a lower nitrogen content in the fill gas allowing the remaining argon to ionize more easily. More modern (240v) coiled-coil lamps with just two filament supports have a higher nitrogen content to help quench any arc formation due to the rotational and vibrational modes of the N2 molecules rapidly carrying energy away. Usually if you turn such a lamp off, it is difficult to safely re-start the arc....unless you think of it as a high pressure sodium lamp and restart it using that sort of gear. If one end of the arc ends up impinging on the nickel lead-ins, they will generally melt back to the press and thermally crack it, letting in the air and stopping the show. Sometimes the arc will embed itself in the press forming a molten conductive glass bridge.....only when there is a choke or another lamp in series though to prevent things spiraling out of control. Well taken photo by the way.....pity it wasn't a clear lamp! Oh, this is 120v in North America!! !....VERY WELL DONE....I imagine this is a very rare event there. It is still quite rare here, (Australia) on 240v, I have only seen it myself half a dozen times, roughly once per decade of my life! The noise is like a blowie in a jam jar. A special type of lamp was developed from observations of this effect...the Point-O-Lite lamp. Point-O-Lite lamps were used in optical design labs in making bomb sights, binoculars, microscopes and telescopes due to their tiny, bright point light source allowing the directions of the light rays through the lenses to be more easily traced. Here in 240v land the filament just glows somewhat brighter (because the arc drop is relatively fixed) but, here the longer filament drops somewhat more. Say the arc drops 80v...then in California there is just 40v left across a filament designed for 120v, but the cooler filament has a lower resistance so although the drop across the filament is just one third, the current would not be a third, it would be more like about half. Here the arc still drops the same 80v and that leaves 160v across the rest of the filament, so, whereas the voltage across the filament there dropped to about 33%, here it is more like 66%, so, here, the filament has twice the relative drop across it it would have there. Also twice the relative drop across a filament originally designed for twice the voltage makes for roughly the same arc current...but as the filament here drops twice as much it is hotter so actually the arc current is quite a bit less here. That 33% left across the filament there leaves little room for change and the arc would be very easily extinguished, here with 66% still across the filament...this leaves still quite a bit of headroom to absorb any changes, hence the reason why I believe this is much more common here....but only in really in cheap Chinese lamps using 1940's filament designs or in genuine 1940's lamps with 5 or 6LC wreath filaments. A approximately twice the arc current, those glowing ends must be bright! It looks like the ends have actually melted back into blobs and it only stopped when the surface area of the blobs got big enough to radiate enough to keep them below the melting point of tungsten. Here the ends do not melt into blobs, the tips of the broken coil just glow brightly at just below the melting point. This is a nice demonstration of just how much lower the impedance of the North American system really is. I see this lamp has a wreath filament and I am not surprised. I've actually seen this 3 or 4 times now, two in this week alone, seems to be really common with these L'image made Sunbeam bulbs. Go and and get as many more as you can so you can study this effect. I saw it when I acquired a whole box of 40w, 240v 1940's lamps with 6LC single coil wreath filaments...I reckon I had/still have 50 of them all the same. I had used a few and at least two of the five or so I used failed in this manner. I have seen standard 2HE coiled coil filament lamps fail like this, but decades apart...usually, with these, the filament breaks at one end at turn-on and the arc rapidly runs back along the filament, particularly in the cap-up position, and comes in contact with the other lead-in shorting the mains right out...there is a terrific bright flash and the neck fuses inside the stem of the lamp (on the outside of the bulb in the air) blow and the whole lot is over in an instant. Flick light switch, pink flash and "tink" sound...followed by darkness....this is the EOL mechanism of most Aussie GLS lamps. GLS = "General Lighting Service", i.e. "Domestic" household lamps. Sadly, that's getting harder to do as last time i was at Dollar Tree (one of the stores that sell these bulbs) they no longer carried them. I will have to check other locations to see if they still have them. Hmmm. I'm a little surprised by the arc colour - I'd expect it more bluish. @Hi Intensity, check out 99c Only. They might have them. @Silverliner: I checked and they also no longer sell them. I reckon this was a "Brumby" batch of lamps....someone at the plant did not realize that the nitrogen cylinder was empty, or very nearly so....so the lamps got dosed with nearly pure argon. I reckon the distributors of these have probably gotten a load of complaints back from people who have purchased them and so they are definitely avoiding getting any more. 1. The distributors keep their sources confidential, they don't want to admit they don't have the skills to create such things. 2. The translation from PinYin, (Chinese represented in Roman characters, e.g. BeiJing, ShangHai etc.) back to the original Chinese characters. (Which, even of you do find the address of the plant...something like "DeGun DongGuan Electric Lamp Works, Lane 5, Yip King Street, DongGuan City, GuanDong Provence, People's Republic of China" you then have to get this back to the original characters because, often one PinYin word can translate back to a number of different characters, with different meanings, but which sound the same. So PinYin is just organized to sound correct when read by a Westerner. is diliberayely out of registration in China and BiDa Maps, (Chinese version of Google Maps) is so bloody difficult to locate on the net. Look at this map of the LuoHu border crossing between ShenZhen in Mainland China, (top) and Hong Kong, (Bottom). The Hong Kong side is in perfect registration, on the ShenZhen side the map is shifted to the south-west with respect to the aerial images by a few hundred meteres....this is the "deliberate silly buggers". It is even more obvious between DongXing (China, Top) and Mong Cai(Viet Nam, Bottom). Almost always the plant name will contain the place name of where it is, like the fictitious example above is in DongGuan (City) which is a suburb/district of GuangZhou, (Canton), which in turn is right near Hong Kong...so you get its location within a few hundred square kilometeres. Almost all Chinese place names contain two words which have some relevance to the geography around that place...like FoShan, where Osram and ADL are..."Shan" means "Mountain" amd I think "Fo" means "Temple" or "Shrine"...and, indeed right near the Osram Plant, in amongst the flat urban sprawl there is a beautiful forest covered hill with a Buddhist Temple on it! I think the actual name of the Osram plant is something like, "Osram FoShan Lighting..." then the street, district etc. So that loosely translates back to, "The Osram Factory near the Hill with the Temple on it". Also, in this case, it was the "FoShan Electric Bulb works" long before Osram came and took it over and modernized it. This is what many of the plants in China are like, old Revolution era, or even pre Communist factories that big western companies have bought into and modernized to make their legacy lamps. Actually there are many lamp plants in and around Fo-Shan. 'ADL which make metal halides is one , their lamp bear all sorts of weird brand marks and are sold in places like pet shops for use over fish tanks and horticultural places to "grow your weeds" under. FoShan Osram is the main legacy plant for Osram, probably not seen so much in North America, but in the rest of the world almost all Osram legacy lamps now come from here. Ya-Ming is the most classic example, it was started by a guy with the surname, "Ya" in 1923. It spawned a whole series of these "Ya" named plants..."Ya-Ming", "Ya-Hong" etc. These made all types of lamps right up to the present time despite all the political and social upheaval that has gone on...the 1948 Revolution, the "Gang of Four cult" etc. In the last 25 years Ya-Ming has become closely aligned with Philips and now almost all Philips Legacy H.I.D. are made at their MaLu Joint Venture plant in the northwest sprawl of ShangHai. The parent YM plant is about a mile away to the north and the make lamps for Venture. In China, only the Government "allows" foreign "takeovers", I think the rule goes something like this....30% remains Ya-Ming, Philips can have 29%...but the Government of the P.R.C. ALWAYS retains the majority share of 41%...so they have ultimate control and can claim any intellectual property that might be created. This is the main reason why Chinese legacy lamps are nearly always outdated designs....because crowds like Pilips and Osram hold back any "flagship" designs that almost certainly contain patented techniques, because if they outsourced them to a Chinese plant there would be "knockoffs" from dozens of plants within weeks! So, before the Philips "takeover" or "joint venture" I think the politically correct term is...Ya-Ming were actually doing quite well by themselves and had a lamp development lab going. They were developing their own designs and techniques...BUT when Philips came along, all Philips' designs were so much "better" that the lab was basically mothballed and the plant re-tooled over to the Philips way of doing things...so the original and distinctive Ya Ming lamps disappeared and were replaced with these "Philipsy" clones, which is a real shame because Ya-Ming was actually doing quite well by itself and making really distinctive lamps. Somewhere here on LG someone has posted up a Ya-Ming high pressure sodium lamp (from before the Philips era), it is the 150w model in a red and black packet...I will try to find it and link it here. (I have its 400w big brother in a yellow and black packet of the same design, but it is buried in the back of the shipping container at present). The real Ya Ming HPS has a unique design due to their lab team....but Philips "flushed that all away"! I have searched and it appears to be gone, this means I need to upload a picture of my lamp. When it comes to Chinese incandescents like the one above, finding the source is so much more difficult than for H.I.D. because only a relative few are doing H.I.D., but a great many are doing incandescent particularly to the old designs. But, really, finding the plant of origin really opens up all the nuiances of a specific lamp of interest simply because the team working at the plant and the machinery...dies, molds etc. imbue the lamp with the "personality" of that place, machinery and team..and tha's what really allows the collector to peer out beyond the "wall" of branding and marketing! If a said lamp "looks Philips" and "Feels Philips" but is branded, "Sylvania".....chances are more than even that it is actually Philips and not Sylvania! I think the reason they're gone is because CA extended it's bulb ban to rough service bulbs (what the bulbs with the C filament design are called out here). Ah, that's interesting how the CA State Government defines an RC lamp. Certainly that is also true here and RC lamps usually have 7 or 9 supports, but the 5 or 6 support wreath were not really considered RC here, thay were just considered outdated. I am about to post some pictures of Aussie lamps' filament structures in the next few hours. It's what the bulbs are called in the US by most manufacturers, they only became popular because the skirt the GLS incandescent bans. It is interesting when you get down to definitions.....best way to silence annoying bureaucrats too...the bureaucrats cannot tell which lamps are REALLY RC....those with lots of supports so the filament won't sag or stretch, but with out of date types, if they are told those are RC...how can the bureaucrat tell that actually are not. It is an interesting situation because Governments normally "make a quantified mark in the sand"...."No lamps less than 12.5 Lumens per Watt...but RC lams are actually LESS EFFICIENT, so then there is no lower limit. The Australian Federal Government did much the same...I think that 12.5 lm/W was the lower limit for all electrical light sources, but we also had two exemptions, one for RC like you have there, (but I think it has been overuled now) and the other was for Decor lamps....you know those squirrel-cage and helical filament things in ST and G bulbs you see hanging in coffee shops and restaurants...so people started buying up 60w squirrel cage lamps en-masse...so the Government then "moved the goal poasts" and put an upper limit of 25w on the Decor lamps. Really solid state semiconductor stuff is actually far more mechanically robust than almost any incandescent simply because they can be made solid right through...so whats not the light emitting die can be completely filled with epoxy, no empty bulbs and fragile glass button rods! I've seen mechanics that are really happy to have a light they can bang about under a car with not a worry in the world! As far as i can tell, decorative (Globe, flame, or as you mentioned, the squirrel-cage) bulbs are still able to get around the bans here, it's just GLS and 'rough service' bulbs that can't be sold anymore. @Hi Intensity it was actually a Department of Energy backdrop regulation that banned Rough Service bulbs because their sales doubled as a result of the incandescent ban on general service A-line lamps. Even the Dollar Tree stores in Florida stopped stocking on them when I visited last December. They still carry halogen bulbs though. @Silverliner: Ok, i thought it was just a CA thing. The bans you have there seem to follow what is happening here very closely...I reckon most Government bureaucrats are reading from the same book! I once had a globe-shaped incandescent do this. It was flickering slightly & making a quiet buzzing sound. 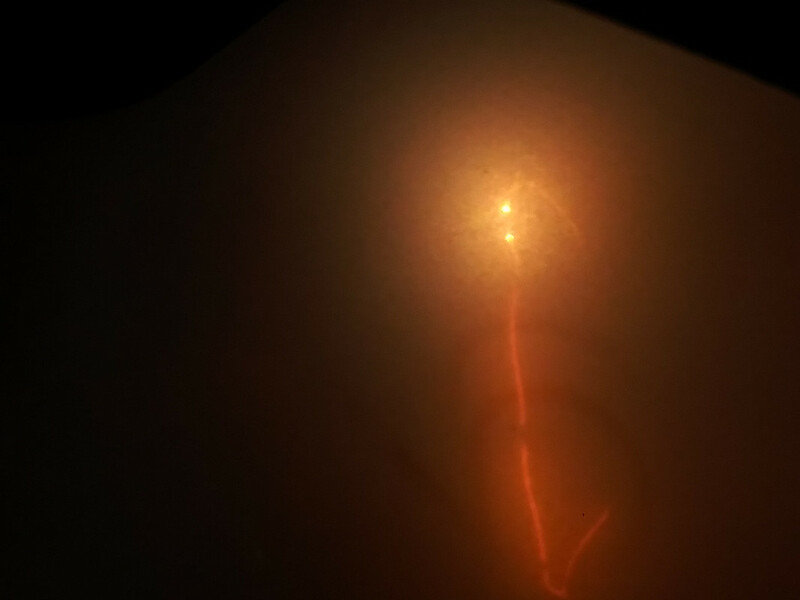 First time I've ever seen something like that happen on an incandescent lamp. 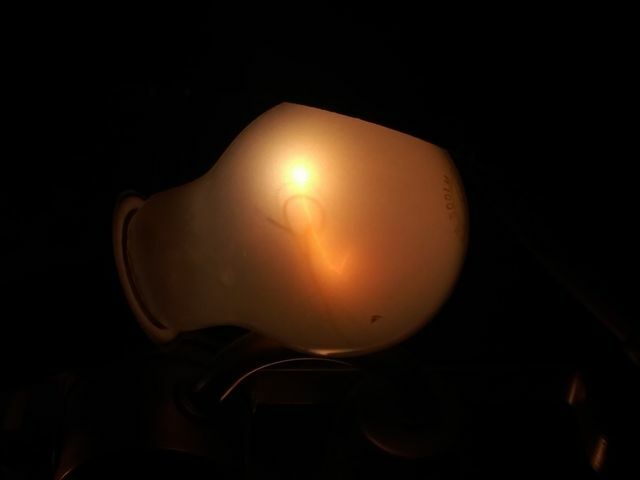 One time at work there was an appliance-bulb that EOL'ed in an even weirder way... formed some sorta arc that looked like a flame inside the lamp, and it would re-ignite after being turned turned off & back on. The decor lamps are not specifically exempted here for the squirrel cage lamps. They are simply outside the scope of the laws. These lamps are so low on output they are outside the scope of the law as it is outside the lower limit, the same reason 25 watt lamps are still legal. Xmaslightguy....I reckon it had the wrong gas fill pressure...low enough to start a glow discharge that then developed into an arc...funny how it did not explode though, being right across the mains! I really can't fatholm why Governments need to "poke their bibs in" at all. The only legislation they need to enact is to set a minimum price per unit...usually by taxing the crap out of the product they wish to be rid of! That is what is done with cigarettes here, the cigarettes themselves, 25 or 30 in a packet, are worth at most a few dollars, but they cost over AU $50.00 per packet because the Government knows it will need to foot the medical bills when that person gets emphysema later. In Vietnam, the same packet of cigarettes is ten times cheaper...because their Government washes its hands of the responsibility of looking after its citizen's health as they age. Same could apply to lamps...if you want 60w incandescents in your lounge room lights, you can buy them....but you will need to pay premium for them that is all. It seems that the Dollar Tree's near me have not only stopped selling the rough service incandescents, but they also stopped selling the appliance, halogen and LED bulbs.